Cook pasta as directed on package, adding sugar snap peas during last 3 minutes of cooking time. Drain; rinse with cold water to cool. Drain well. Meanwhile, cook fish sticks as directed on package. Carefully cut each fish stick into 3 or 4 pieces. In large bowl, combine dressing ingredients; mix well. Add cooked pasta and sugar snap peas, coleslaw blend and bell pepper; stir to coat. Add fish sticks; stir gently to mix. Arrange lettuce blend on individual serving plates. Spoon salad onto lettuce. 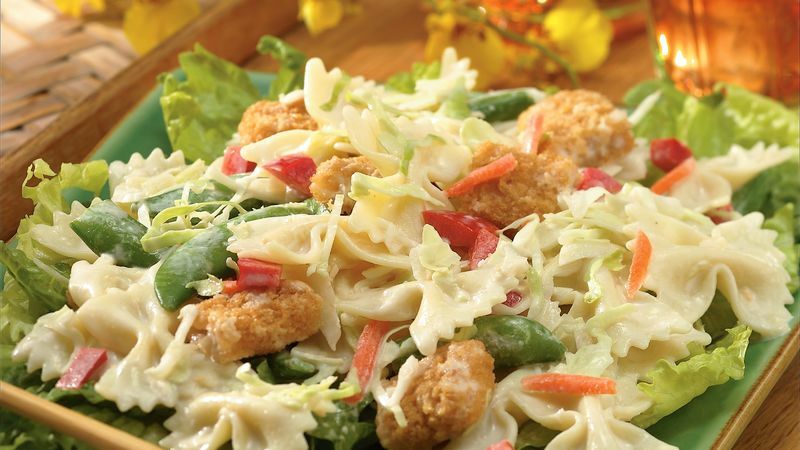 Try this salad with a 10-ounce package of frozen breaded chicken breast chunks. Just cook the chicken as directed on package.